The school has six major research groups reflecting its particular strengths within optometry research. The primary goal of the Cell and Molecular Biology of the Retina laboratory (CMBR) is to further the understanding of retinal function and development in the normal and diseased retina. Dr Monica Acosta, principal investigator, says her researchers are particularly interested in characterising the mechanisms of cell loss in the retina to aid the understanding of conditions that lead to blindness, particularly age related macular degeneration. The strategy of the research is to characterize the human and animal model retina to advance clinical consideration of ocular diseases. A specific interest is the role of the retina as an “extension of the central nervous system” to aid in the diagnosis and treatment of brain conditions. 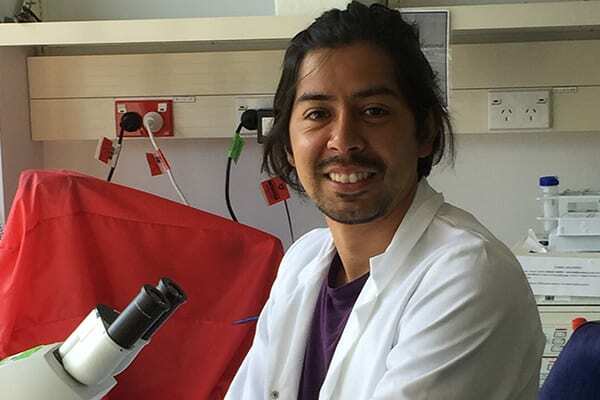 Joaquin Araya (PhD candidate, University of Santiago de Chile) spent his 3 months internship at the lab completing work towards one chapter of his thesis. He is studying the electrophysiological response of the retina in Alzheimer’s disease using the 5XFAD mouse model; he came to New Zealand to study the structure and neurochemical composition of the retina in this model supported by a scholarship from CONICYT-Chile.